All orders are shipped on Monday or Friday. Please advise what day you prefer. Minimum order is AUD $75-00. Payments to be made to Ivan's Orchids either by money order or Direct Debit. Please email me for account details. I send by AUSTRALIA POST. If you prefer others, let me know. Cost of shipping will be advised after packaging and weighing. If you want me to send 'overnight express', please advise, but there will be extra freght charges. Please let me know ,if your State or Territory,requires permits,extra charges will be involved. Ivan's Orchids will not be held liable if you do not advise me. All 50mm pots will be sent as whole unit, Please advise if you wish for larger plants to be sent in pot or bare root. 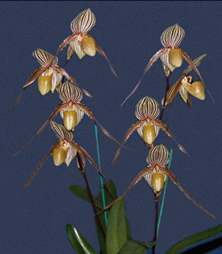 Ivan's Orchids gives no warranty, expressed, implied as to the productivity of all plants.Many crosses are speculative, as it is impossible to predict the out come of hybrid crosses. My liability, in all instances, is limited to the purchase price of all plants I sell. Athough all care is taken by Ivan's Orchids to pack the goods carefully, so no damage occurs, Ivan's Orchids liability ceases the moment the transport couriers receives the package. If damage occurs, please advise the transport couriers and myself.